It is with sadness that we share the news that St Hugh’s Alumna, Nancy Sandars, prehistorian and archaeologist, passed away peacefully on 20th November 2015 at the age of 101. 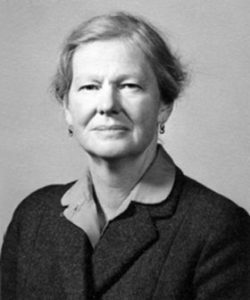 Widely travelled, Nancy took part in her first archaeological excavation in the 1930s, after her sister, Betty, who studied at Lady Margaret Hall, introduced her to Kathleen Kenyon, Principal of St Hugh’s College from 1962 to 1973 and hugely influential twentieth century archaeologist. After studying at the University of London and gaining a postgraduate diploma in Western European archaeology from the Institute of Archaeology, Nancy came up to St Hugh’s. She gained a B.Litt. in Archaeology, working with Christopher Hawkes, Professor of European Prehistory. Her thesis for the degree later became her first published book: “Bronze Age Cultures in France” (Cambridge University Press, 1957). A full list of her publications can be found on her website. Nancy served during the Second World War as a motorcycle dispatch rider and later, as a German speaker, was assigned to “Y” branch of the Government Code and Cypher School at Bletchley Park. Full obituaries can be found on the websites of the Telegraph and the Times.